I'm very late in posting the minutes from our December Meeting/Social...but as they say, better late than never!! 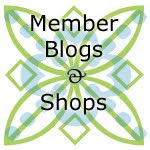 "When you attend a quilt show, do you wonder why some quilts have ribbons and others do not? Do you hesitate to enter a quilt competition because you don't know what happens in that judging room? 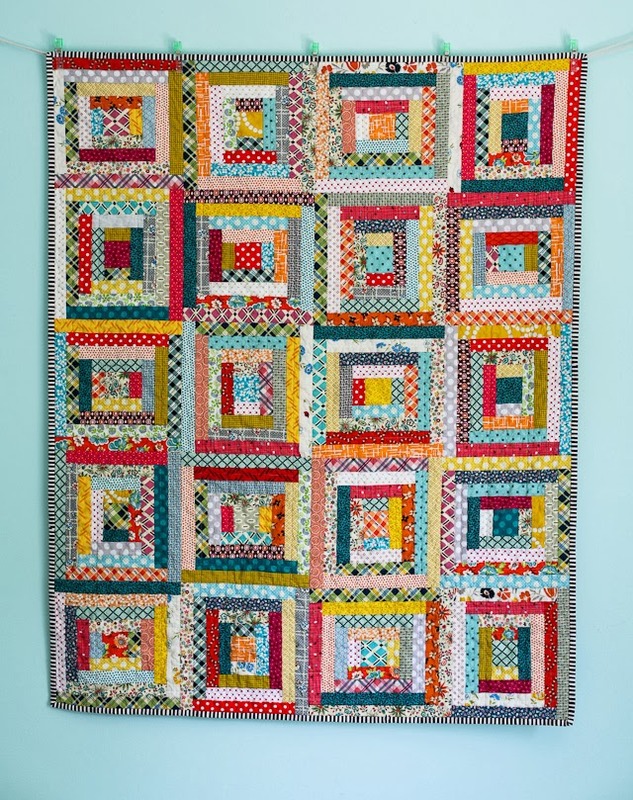 Come and hear a certified judge explain what really happens in the judging room, what it takes to make a blue ribbon quilt, and why it is important to enter quilt shows even if you don' t win." The 2014 Monthly Mystery Quilt-along hosted by Kristin L will replace our monthly block lotto for 2014. She has already posted the initial information and fabric requirements, so check it out now so you don't get too far behind! Also, the 6.5" unfinished Banner Block is due. Remember it can be any design made with whites and brights. We also will be making board nominations, with elections at the February meeting. The current positions are President, Vice President, Secretary, Treasurer, and Web Coordinator. Saturday, February 8th: The Amanda Jean Workshop on Scrap Management will be held at The Textile Center. Watch Facebook for more information on this event. Thursday, February 13th meeting -- Jen Madsen of Stitch Simple and fabric designer, Josi Severson of Home Fashion Fabrics, will share information on Josi's fabric line and working with organic fabrics. And the NY Modern Guild Swap is due for those of you who signed up to participate -- 12" finished mini quilt with the theme of "Love". Thursday, March 13th our Monaluna Modern Meadow Challenge is due. We then had Show and Tell (click over to Flickr to see the pics) and finished up with a rousing game of "Steal the Fabric". Thank you to everyone who came to the meeting (the weather could not have been worse!) and for sharing your food and fabric. It's always a fun way to end the year. Happy New Year and hope to see you in a few weeks! Hi! It's Vanessa of Punkin Patterns here today to start a new blog series on our favorite quilting books. 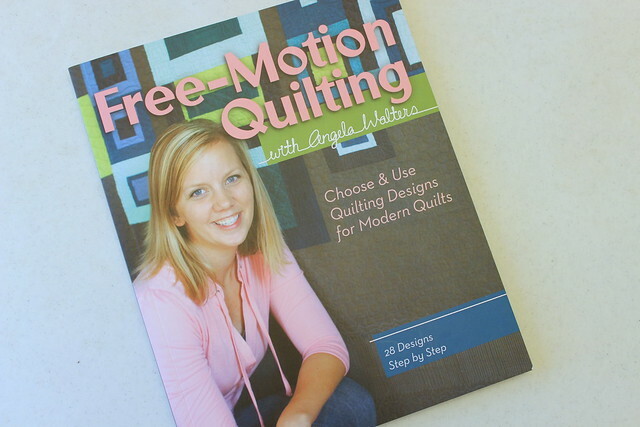 I'm really excited to start the series because I knew just which book I'd talk about: Angela Walters' book "Free-Motion Quilting". 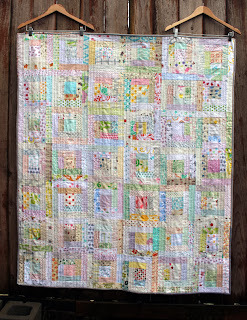 Anglea Walters has been quilting and blogging on her blog, Quilting Is My Therapy, for some time. If you're unfamiliar with her work, you can check out her online portfolio. 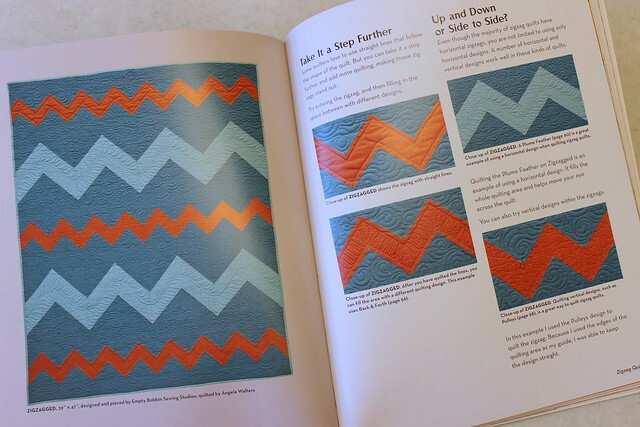 Her book takes you step-by-step through many beautiful quilting designs. My favorite part -- she not only teaches you how to do the first shape in the quilting design, but she teaches you how to move into the next shape of the design and continue. The hardest part about free-motion quilting is knowing where to go next. This book makes that so much easier to learn. 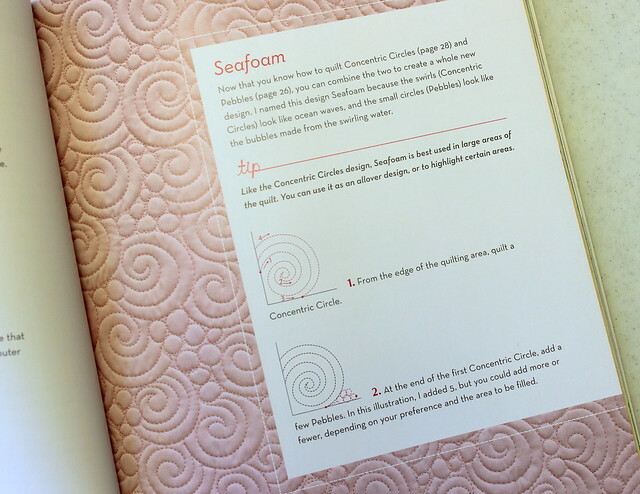 The book is also filled with tips like how to sketch out the quilting patterns to get used to where to go next and there is a great discussion on batting and thread. 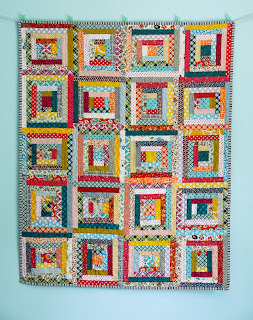 She also gives insight into how she designs quilting patterns around the piecing of the quilt. I've only used this book a little so far, practicing free-motion stitches on scraps. I'm very excited to try some of these techniques on my next quilt. time-saving techniques - such as more piecing and less pinning! I'm sure I will think of more ideas...this is just a start. What are your next year's resolutions? 1. Trace and cut out your state of choice -- I used a 3x5" note card and my state measures about 3" wide by 4" tall. 2. 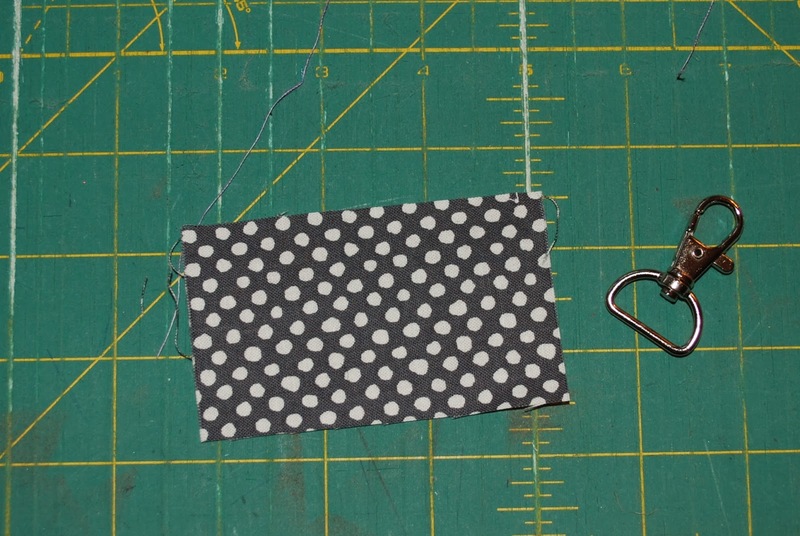 Scraps of fabric for the front, back and to attach the key clip, plus a little red scrap for the heart. 4. And a key fob, clip or circle thingy (nice description!) for the key holder. 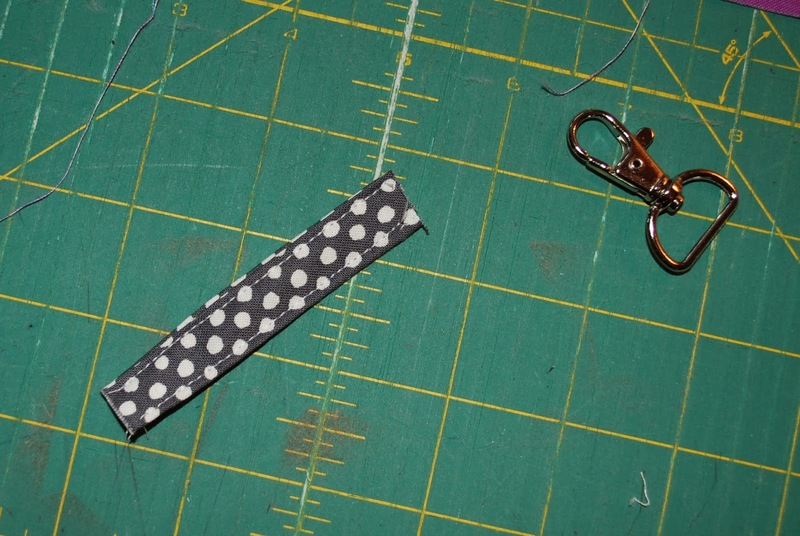 The first thing I do is sew the key clip fabric together. Simply fold the two long edges of your fabric into the center and press (this fabric is about 2 inches wide by 3 inches long). Then I fold that in half again, press and sew down each side (I'd say an 1/8 of an inch from each edge). Thread the fabric into your key holder and set it aside for a minute. IMPORTANT STEP: Take out the key clip and fabric holder and get your sandwich all nice and neat. Now trim the top of the sandwich to your outline of the top of the state. 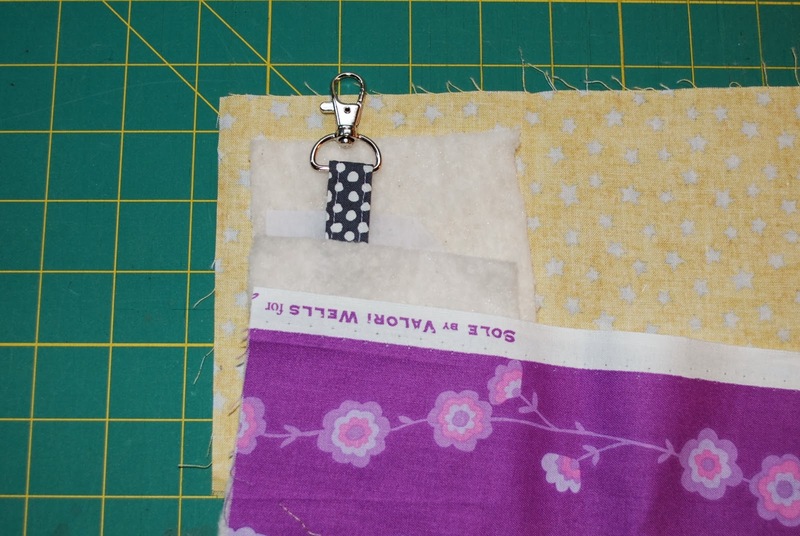 Put the key clip/fabric holder back into the sandwich -- I put mine on each side of the interfacing -- and pin it in place. 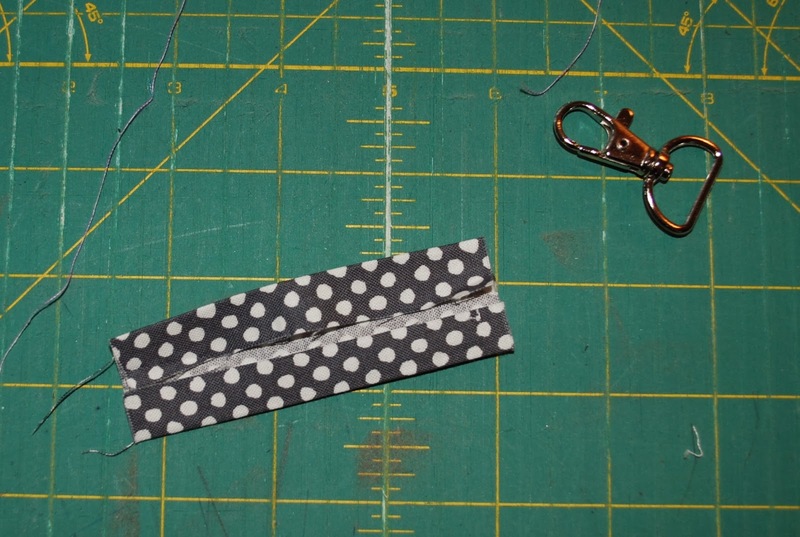 If you don't do this step, when you get done sewing it together, trimming the interfacing inside the key clip fabric is going to make you go crazy. Now you can free motion around the outline of your state. I do this with black thread on the front and white thread in the bobbin. I free motion around the state three times because it looks messy and I prefer messy. 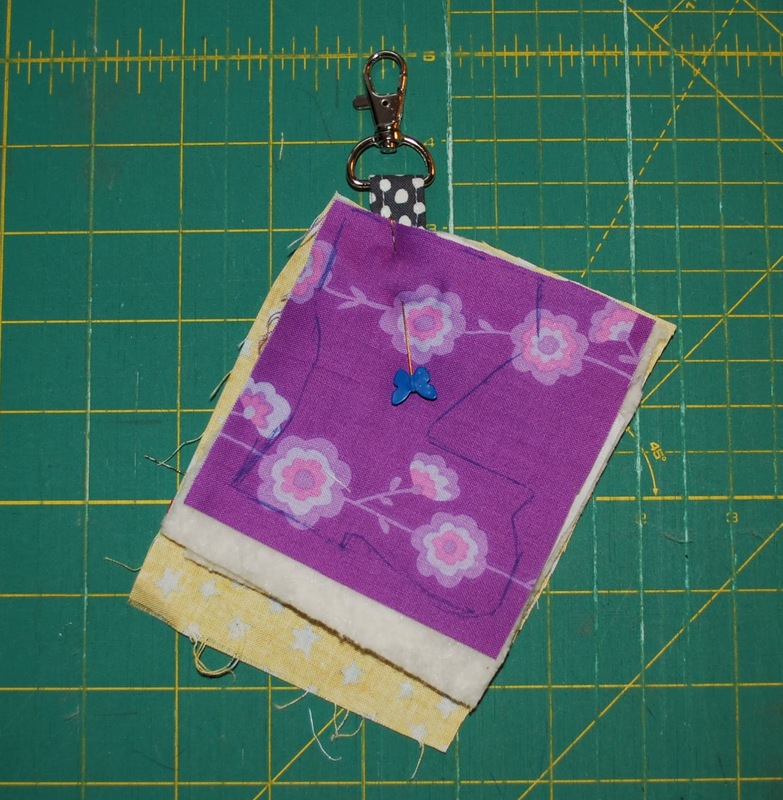 Free motion around the heart and then trim the excess fabric and batting from the outside of your free motion state stitches and you will have a Quilted State Key Chain! I've been making these for my daughter to give to her girlfriends that still live here in the Twin Cities, some that have moved out of state and for those who are from other parts of the state and are living here now. These are super simple and quick to whip up. The hardest part is finding the key clip hardware (I found my clips on eBay). JoAnns and Michaels sell the circle key holders in their jewelry sections and would work just as well as the clips. I had such a great time at the MMQG quilt retreat a few weeks ago. Having an entire weekend to sew with hardly a break was a dream. I left the retreat completely re-energized to quilt and feeling good about the progress I had made. I also left the retreat with a growing shopping list of tools and gadgets that I discovered I *need* after hearing about a favorite marking tool, or trying someone else's iron, or just realizing that my sewing setup isn't easily mobilized for sew-ins and retreats. Given the season, I thought I'd compile some gift ideas based on things I discovered at the retreat as well as all-around gifts that (I think) most quilters would enjoy but a non-quilter might not know how to shop for. Admittedly, this post is a little self serving, as it focuses on a few things that I might like. However, I'm hoping that these ideas might find their way into Santa's inbox so that all "good" quilters of the world find a nice little something under the tree. With 13 shopping days left, here are some holiday gift ideas for the favorite quilter in your life. Hera Marker-- The Hera Marker is a simple and inexpensive tool for marking simple designs on quilts (straight lines or gentle curves). It doesn't actually "mark" your quilt with ink or chalk, which is the beauty of it. It simply puts a fine crease in the quilt that you can see just well enough to follow along with your machine. No need to wash out, and it works on light or dark fabrics. Colby had this at the retreat, and Annik currently has one of these as part of a larger giveaway on her blog. Pinmoors--If you are not into spray basting but want an alternative to safety pins, Pinmoors might be a great tool to try. Annik mentioned these at the retreat and I'm pretty curious to try. Magnetic Pin Cushion-- Kristin, of And Chips, wrote a lovely ode to her magnetic pincushion on her blog. So simple, but so often the best tools are. Charm Packs or Jelly Rolls-- The non-quilter may not know what these are, but these fun little pre-cuts represent endless possibilities wrapped up in a cute little package making them perfect stocking stuffers. 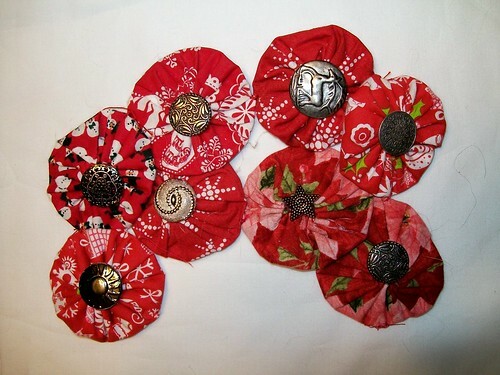 Head to your nearest local quilt shop to find a selection of these or try searching on Etsy. Thread-- I'm not a huge thread connoisseur, but many quilters are. The good stuff can be a little pricey. 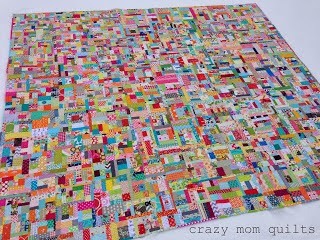 To a non-quilter, this will seem very basic and not very exciting (kind of like getting underwear in your stocking). 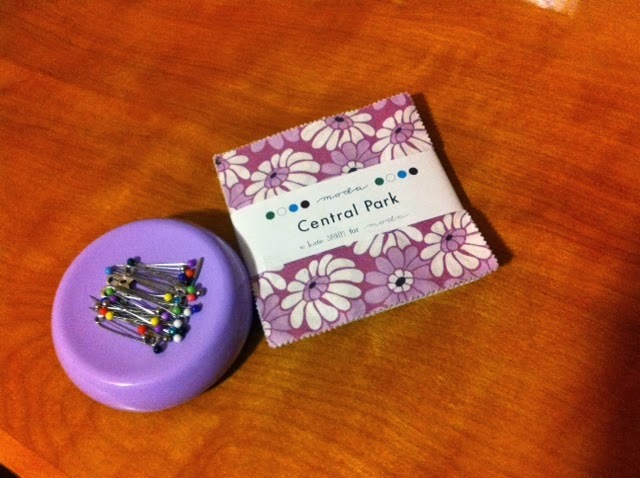 But trust me when I say that a nice pack of thread can generate a lot of goodwill toward the giver. 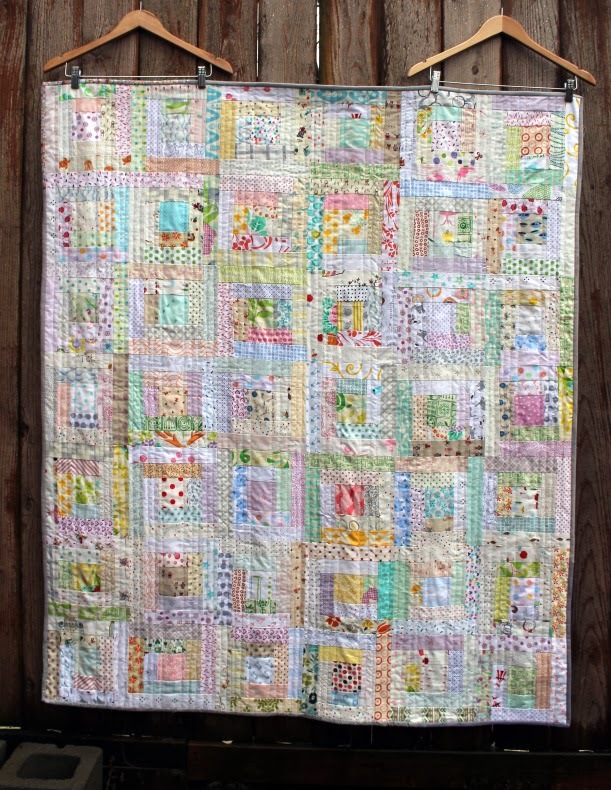 Vanessa and Kristin recently featured some lovely mini quilts using Aurifil's line for Camille Roskelley. So much pretty in a small package! Fabric Shop Gift Cards-- What quilter doesn't love to buy fabric? 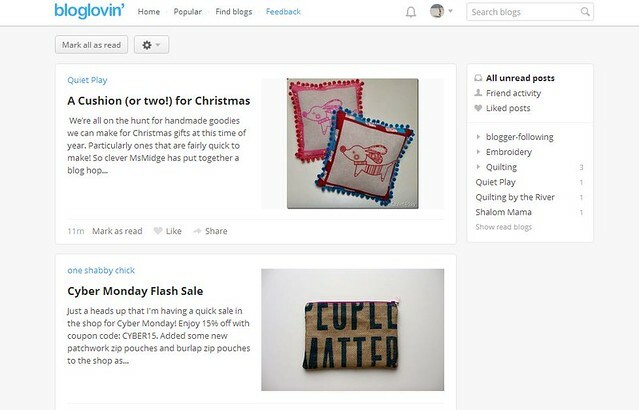 A gift card to the local quilt shop or an online marketplace like Etsy provides an opportunity for a little guilt-free indulgence. If Santa is a bit handy, maybe he would make you one of Kristin's Big A$$ Ironing Boards, for which she has kindly created a tutorial for here. It might be difficult to get down the chimney, but after using it at the retreat, I'm convinced that I need to have one and hope that Santa will agree. Quilt Sticks-- I was lucky enough to win a set of these as a door prize at the quilt retreat. I love them. They don't slip when you cut and once you pick your desired strip width, cutting is quick and easy. They are also locally made right here in the Twin Cities. 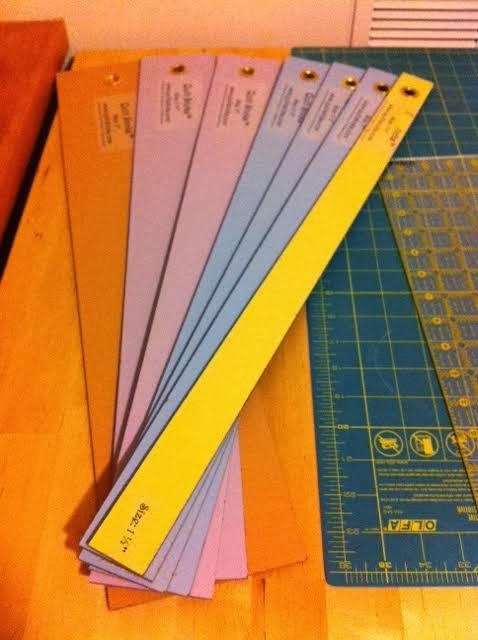 Kona Color Card-- This was another great giveaway at the retreat. I've always wanted one because though there are endless colors out there, finding the right color for your quilt can be challenging if you don't see all the options together. Having this on hand can help find the right color without guesswork. Rolling Sewing Machine Tote-- Many people use a regular suitcase for this, but mine is not quite right for my machine. They come in a wide price range (up to very pricy), but those carried by the sewing chain stores (JoAnn, Hancock), often go on sale or can be purchased with a coupon. 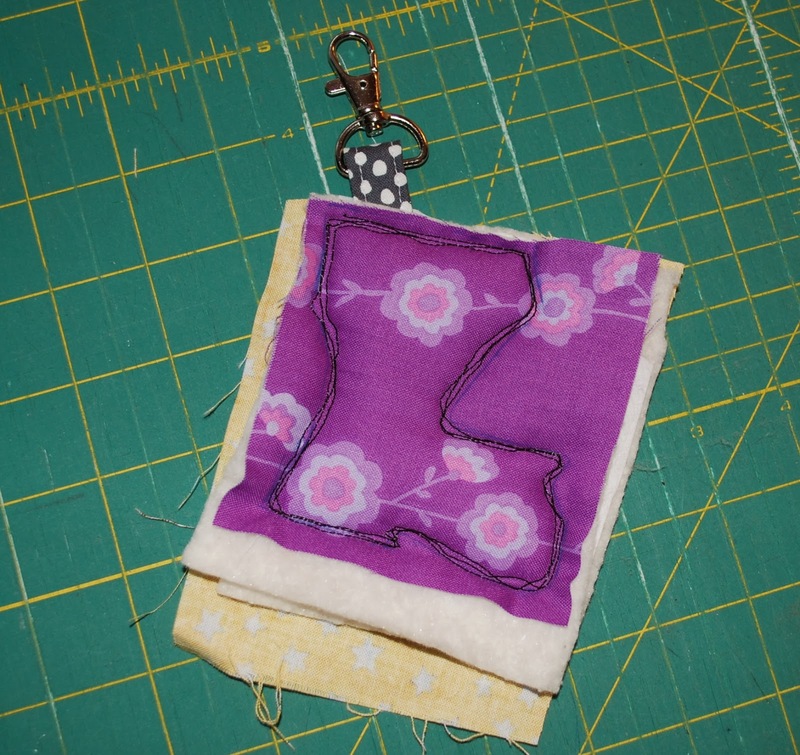 This is a great gift for the quilter who goes to a lot of classes, sew-ins or retreats. Fabric Bundle-- I've actually never purchased one for an entire fabric line, which is why it would be one of those really special splurge-type gifts. 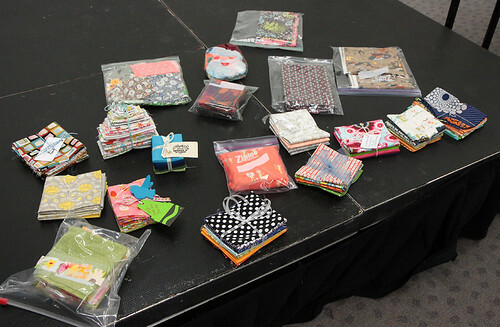 This is much more of a commitment financially and fabric-wise than a charm pack or jelly-roll , so I recommend having a good idea of what fabric lines your quilter likes before picking one of these up. You could try stalking their Flickr site or Pintrest if he/she has one. Asking them the old fashioned way works too! I think I've been pretty good this year, and am hoping Santa agrees. What do you hope to find under your tree? 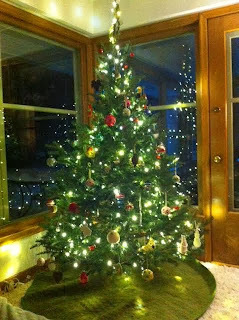 Saturday Series: Holiday gifts (and decorations). 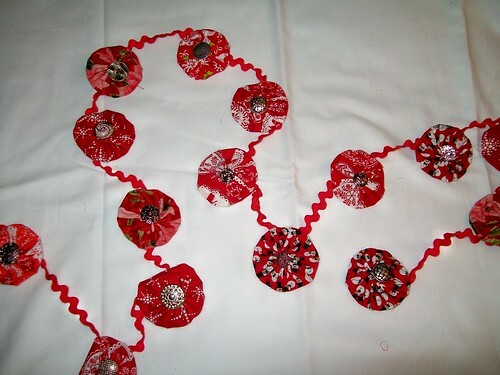 About two years ago, as I wandered around on Pinterest, I came across a super fun yoyo garland made by Kirsten and featured on the Sew Mama Sew page. 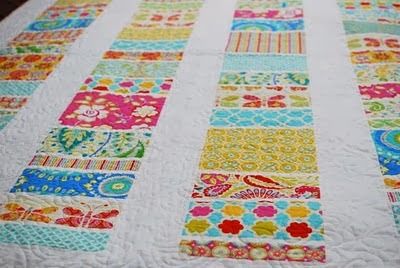 This looked like a great excuse to do something different than a quilt. 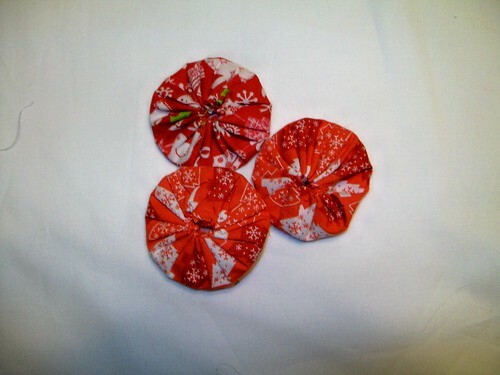 I bought a bunch of red and white Christmas prints, a yoyo maker (because I'm too lazy to do it the old fashioned way and it's a great excuse to buy a gadget), and then went hunting for silver buttons, because I had my own vision for this project...... if you haven't made yoyos before, great tutorial over here. And then, searching the blogosphere I found a new solution at SouleMama, sent up a silent (okay, maybe it was more like a happy dance) thank you to her and got to work. And then used ricrac and hot glue gun to put it all together. TADA!! Yo yo garland for the tree. And, if this is a bigger project than you'd like to take on you can just make a couple of yoyos, but a hook through and you have a quick and fun Christmas ornament.